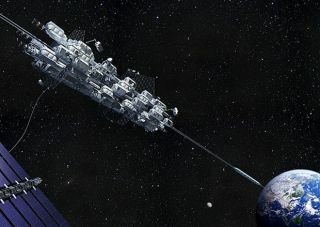 Taking the space elevator — payloads and people get a lift off planet Earth in this artist's illustration of the innovative space technology released by the Japan Space Elevator Association. SEATTLE — Sure, it's a stretch. Envision a thin, vertical tether extending from the Earth's surface to a mass far out in space. Scooting up the tether are electric vehicles, climbers that are energized by a combination of sunlight and laser light projected from the ground. Here's the kicker: Carrying payloads and people, the climbers travel at speeds comparable to those of a fast train — taking several days of transit time — but are launched once per day. These space elevators have the potential to be a revolutionary way to access space less expensively than possible with chemical rocket technology. And innovators today are working to make that happen. International Space Elevator Consortium (ISEC) participants, including Elevator Speech winners Lana and Campbell Gorlinski, holding their prizes — Amazon.com gift cards. The space elevator discussions, which ran from Aug. 22 to 24, could be described as a kind of "heightened awareness," as scientists, engineers, entrepreneurs, infrastructure experts and others brainstormed climber designs, new materials, technology trends, business strategies, operations and legal issues. Among the space-elevator devotees taking part were officials from the Japan Space Elevator Association, which spotlighted a number of climber approaches, promoting the idea of a climber competition as a worldwide event. For good measure, toss in a sort of space "elevator pitch" competition. That is, selling the idea to an influential person — say, Microsoft co-founder Bill Gates — in 90 seconds. How best to ask for their buy-in of the concept — without being tossed into the elevator shaft! "The conference was a rewarding experience … good ideas, new concepts and great participation," said Peter Swan, president of the International Space Elevator Consortium. "The ISEC was developed to specifically broaden the knowledge about space elevators and incrementally reduce the risk for its development," Swan said. "We're trying to address the unknown unknowns that are out there." Strong man tactics! Bryan Laubscher, president of Odysseus Technologies, is deep in new materials research. Skip Penny, ISEC director, said the space-elevator gathering was an opportunity to "have a spark create another spark." The space elevator is a huge systems-engineering job, he added. "We're so far away from bending metal," Penny told Space.com. "We're advancing, but there's need for money. It is two steps. One is seed money so we can refine our ideas and understandings, then build product." So what's next on the ISEC agenda? "The next steps for the development of space-elevator infrastructures are focused around the creation and funding of a Space Elevator Institute," Swan said. The institute would fund research projects addressing critical issues. The development of prototype experiments, including tether material design for tensile strength, would be funded by the Space Elevator Institute, he added. Currently, the "magic" material that's boosted the promise of a space elevator is the carbon nanotube. But moving from vials of the stuff to miles and miles of space-worthy tether is no easy task. Similarly, graphene is also being eyed as a potential material for the space elevator. Graphene is pure carbon, remarkably strong for its very low weight and far stronger than steel. Off to the races: A robotic climber competition between student teams around the region was held. Middle- and high-school-level robotics teams built and programmed autonomous, tether-climbing robots. Prizes were awarded to the top-performing teams and for innovative robot design. Revolutionizing high-strength materials for a better world is the quest of Bryan Laubscher, president of Olympia, Washington-based Odysseus Technologies. "You have to work on materials," Laubscher told Space.com "Making carbon nanotubes through chemical vapor deposition is so inferior to what we could get." Laubscher is working to grow carbon nanotubes in a new way, with experiments on his near-term to-do list. "Carbon nanotubes and graphene could be the way forward … pervading society and gaining accelerated acceptance by society … like the industrial revolution did in creating cheap steel," he said. "When the carbon nanotube or alternative material develops to the point where we can actually build a space-elevator tether, we want to be at a mature design phase," Swan said. "Then, we can go right into the development, planning and execution of a space-elevator infrastructure." Admittedly, the tether material is a major hurdle, Swan said. "Taking that material and grow[ing] it 1 meter (3 feet) wide and over 62,000 miles (100,000 kilometers) long — neither of those is a trivial activity." Swan said the material challenge is not being driven by the space industry. Rather, automobile makers, airlines and even the ski-lift industry are looking for stronger materials. "The beauty of the situation," he said, "is that the global need for the material is driving it — and we just need to tag along." For more information on the International Space Elevator Consortium, visit http://www.isec.org. Leonard David has been reporting on the space industry for more than five decades. He is former director of research for the National Commission on Space and is co-author of Buzz Aldrin's 2013 book "Mission to Mars – My Vision for Space Exploration," published by National Geographic. Follow us @Spacedotcom, Facebook and Google+. Original article on Space.com.